Enchiladas Rancheras $16.95 Two Enchiladas Filled With Lettuce, Red Chili Salsa, Parmesan Cheese, Onion & Oregano; Your Choice Of Chicken, Ground Beef, Picadillo Rolled & Topped With Ranchero Cheese, Sour Cream, Guacamole, Rice, & Beans. Enchiladas Chipotle $16.95 Three Corn Tortillas Filled With Your Choice Of Chicken, Ground Beef Or Shredded Beef. With Our Special Chipotle Sauce. Served With Rice & Beans. Enchilada Espuelas $16.95 Rolled Flour Tortilla Filled With Your Choice Of Picadillo (Shredded Beef), Chicken, Beef, Cheese, Or Refried Beans. 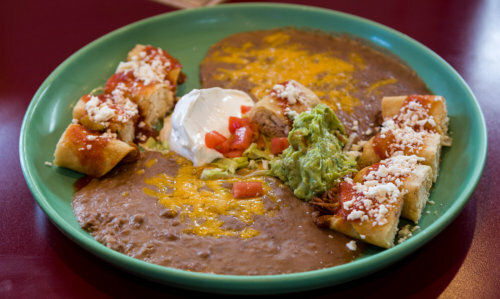 Topped With Enchilada Sauce, Melted Cheese, Lettuce, Tomato, Sour Cream, Guacamole, Served With Rice & Beans. 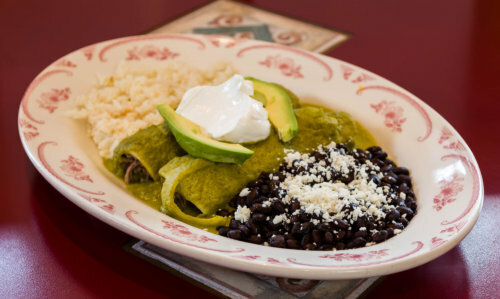 Enchiladas Verdes $16.95 Two Corn Tortillas Filled With Your Choice Of Chicken, Ground Beef Or Shredded Beef. With Tomatillo Sauce Smothered With Sour Cream & Avocado Slices. Served With Rice & Beans.